There is nothing like getting some new peripherals to enhance your gaming experience and bring you joy. 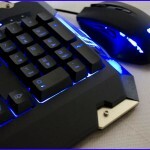 As silly as it may sound to some, a good mouse and keyboard can go a long ways and a good headset is crucial dependent on the genre of games you play. Peripherals come in all different shapes, sizes, type and can have a plethora of different features. 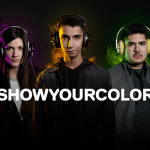 A lot of companies are currently going with RGB everything. 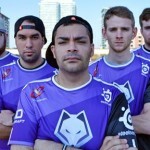 When it comes to peripherals, it is important to take individual playing styles or need into consideration as not all gamers are alike. 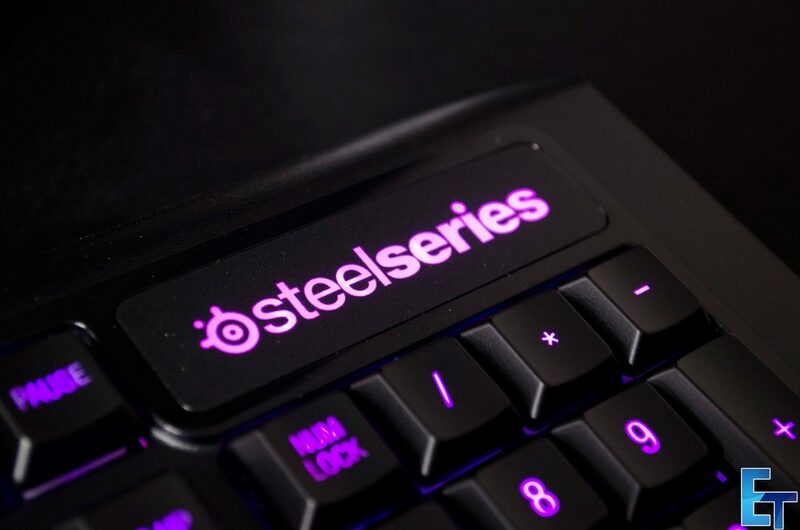 One thing most of us can agree on is that mechanical keyboards are amazing and that is what the good folks at SteelSeries have sent me today. 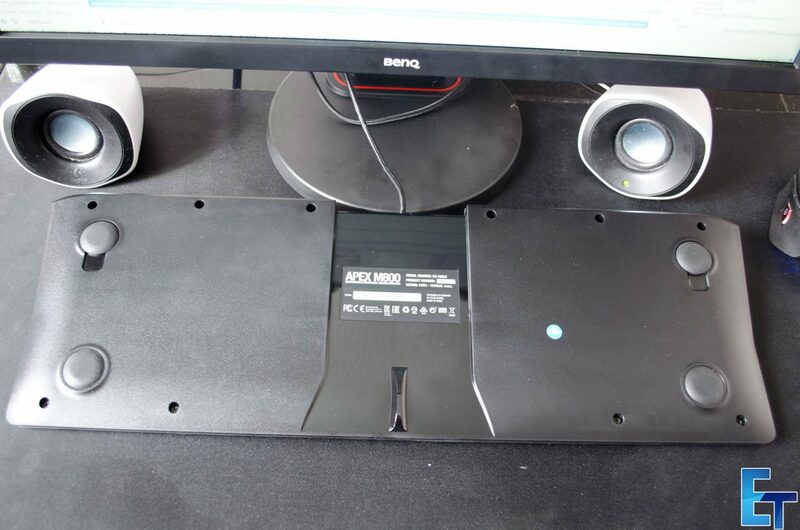 Today I will be taking a look at the APEX M800 from SteelSeries. 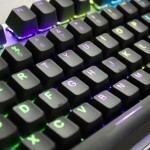 This is a customizable mechanical gaming keyboard that has some pretty impressive and unique features, the biggest of which is the newly designed QS1 mechanical switch which is said to be the world’s fastest. 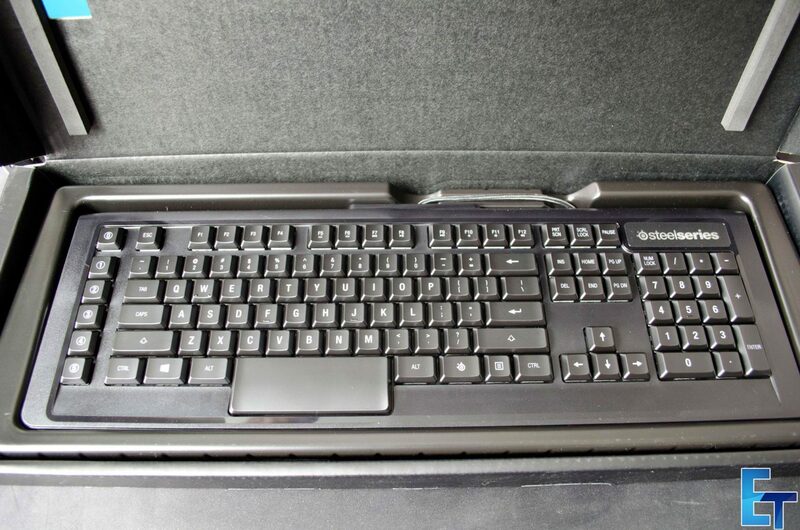 The keys of the M800 feature a low profile layout and the keyboard is also equipped with dual processors, one of which is designed just to register key presses! 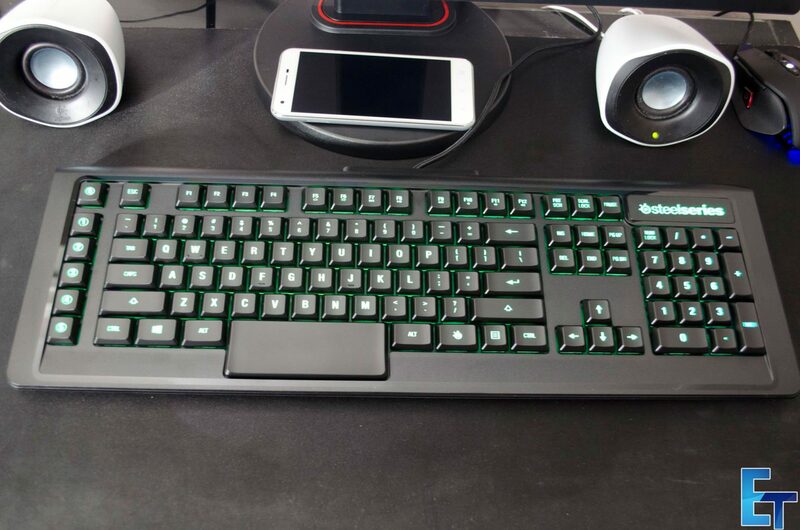 The M800, also, of course, has all the standard features of a mechanical keyboard such as N-key rollover, quick access keys, individual key illumination and more. Needless to say, the M800 is packing some pretty serious features and if it’s half as good in real life as it is on paper, we’re in for a real treat. The M800 comes very well packaged and can be a bit of a pain to actually get all of the way out of the box. One of the things that instantly drew my attention was the spacebar. I knew it was going to be bigger than normal, but seeing it in person really put it into perspective and I must say, it works amazingly well. The low profile keys really do seem to work well for the M800, even if it does take a bit of time to get used to typing on them! Inside the box along with the M800 are some stickers, extra key caps, manuals and a couple of rubber feet that we will take a closer look at in just a few moments. Something that we are seeing more of these days, is the high-end keyboards are coming with a dual-USB connectors. This will help power all of those extra RGB LEDs and other features that we are all coming to know and love. 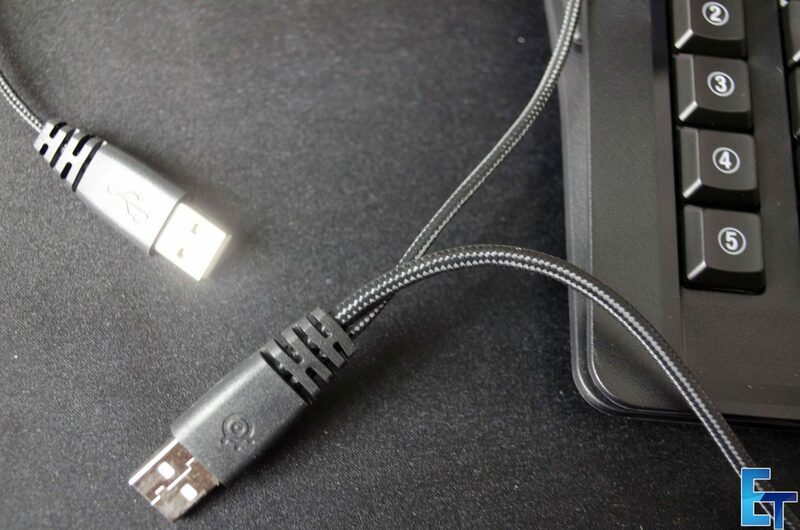 SteelSeries have gone ahead and braided this cable as everyone seems to want braided cables these days, they surely do look much nicer than those old rubber coated wires we used to get. 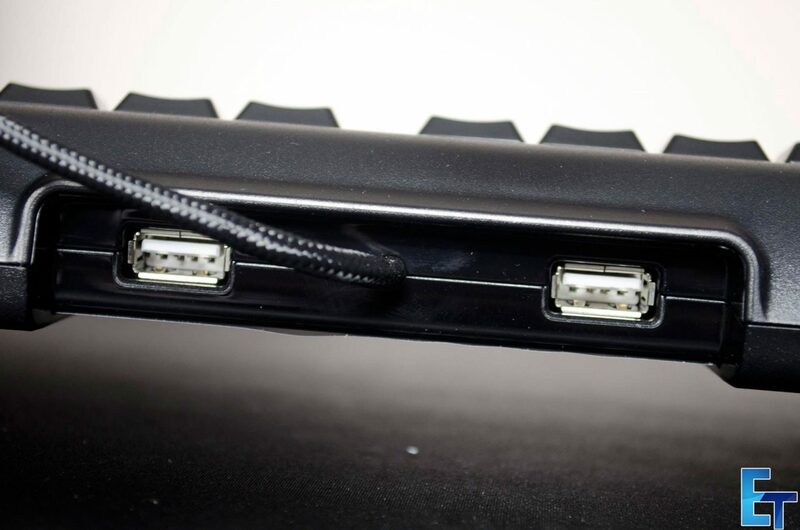 Another reason for the dual-USB cable is to help and power up the dual USB connections on the keyboard, this will allow you to plug a USB mouse and headset right into the keyboard which can prove to be quite handy. Here is where the rubber feet come in handy! 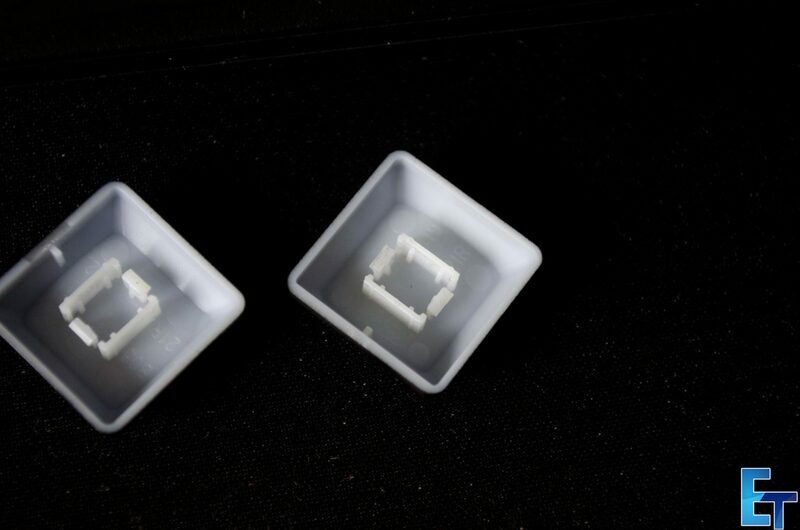 They are used to raise up the keyboard a bit, as you can see in the photo below the top two rubber feet can actually be removed and swapped out for the pair that came as extras in the box. 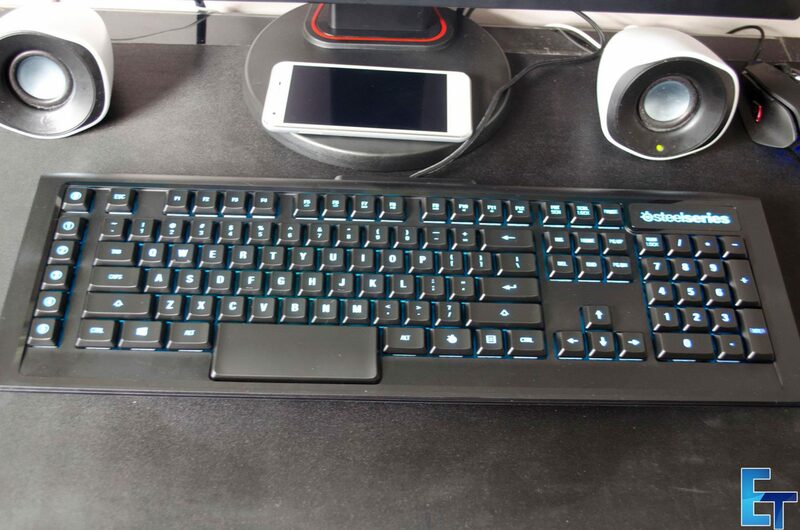 This is a unique way to raise up the top of the keyboard, but it surely works and didn’t cause me any issues during testing. As mentioned, the M800 features newly designed QS1 switches. 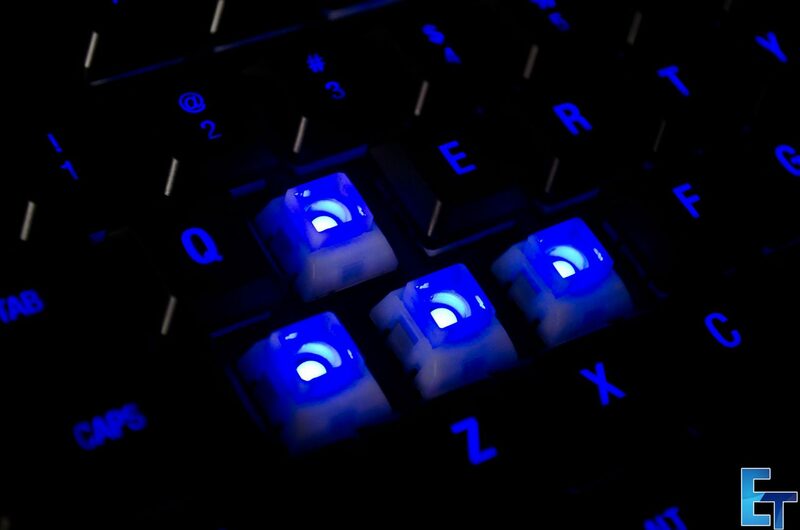 Not only do these offer a 25% quicker actuation, they also have their LED right in the middle of the switch as to light up the individual keys better. 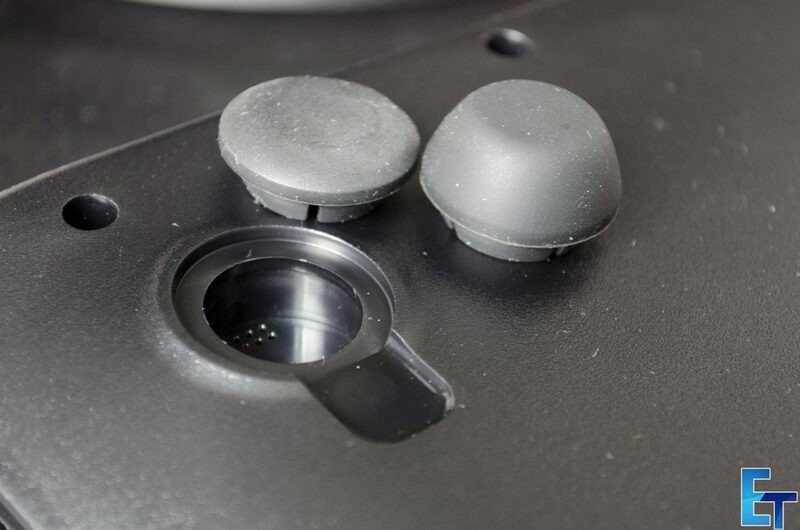 These QS1 switches were designed for pure speed to offer the best gaming experience possible and let me just say, they surely do not disappoint, that is for sure. 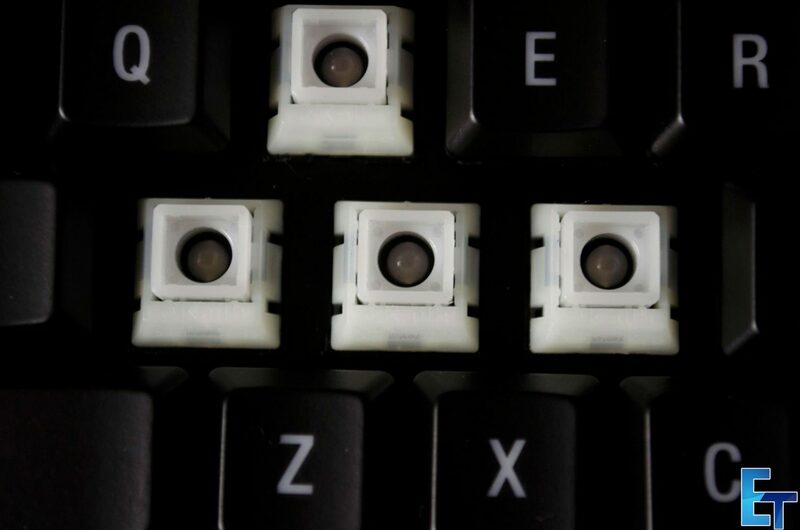 Once you get used to the lower profile keys, they M800 is amazing to game and type on, it really is just that simple and you can definitely feel the difference in every key stroke vs that of other mechanical switches. 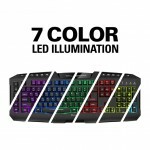 The SteelSeries APEX M800 features a per-key backlight illumination and as such, there are a plethora of combinations for users to choose from and set up to get their desired effect. Using the software that is easily downloaded from the SteelSeries website couldn’t be any easier and it has some nice pre-set templates that I took a look at in the video at the beginning of this closer look section. One thing that took me by surprise was the side lighting, I just happened to notice it one day when walking by and was quite happy to see it. It’s not so bright as to draw attention away from the rest of the keyboard but it does add a nice be of accent lighting to the sides of the M800. 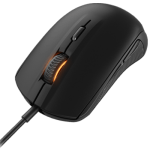 The APEX M800 is compatible with the SteelSeries Engine 3, which can be downloaded from the SteelSeries website, CLICK HERE to check out the downloads page. 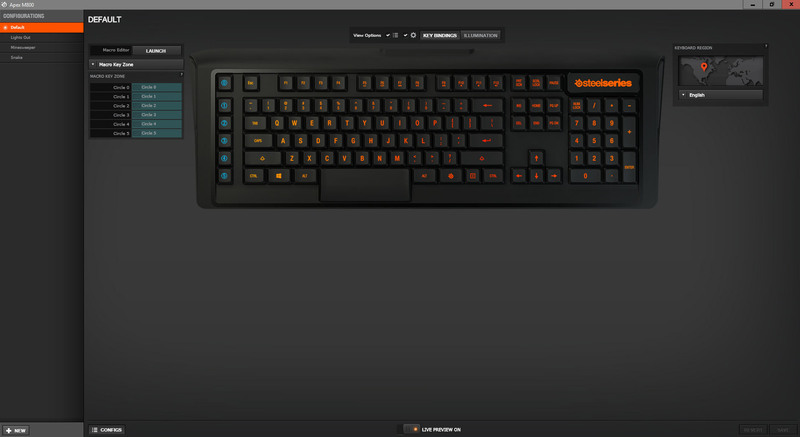 Once installed, the SteelSeries Engine 3 will list which devices you have that you can customize VIA the software. Another awesome feature is the GAMESENSE tab which allows you to set certain profiles up for specific games. 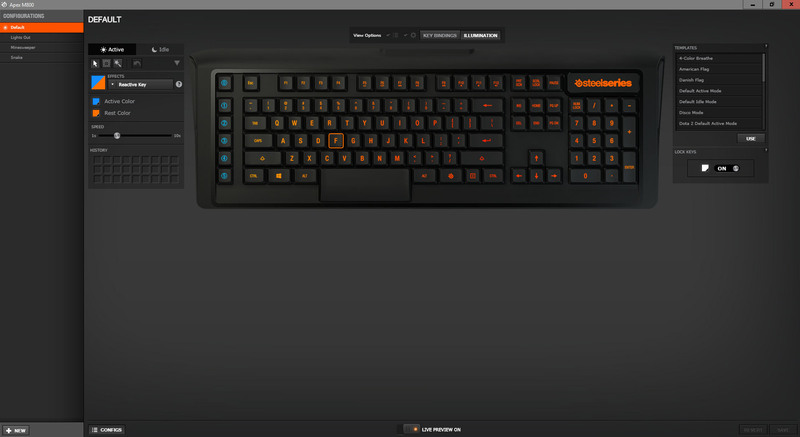 As you can see, SteelSeries have added DOTA 2 and CS:GO as some of the standard options. Once you chose the M800, it opens up a new screen with some more options. 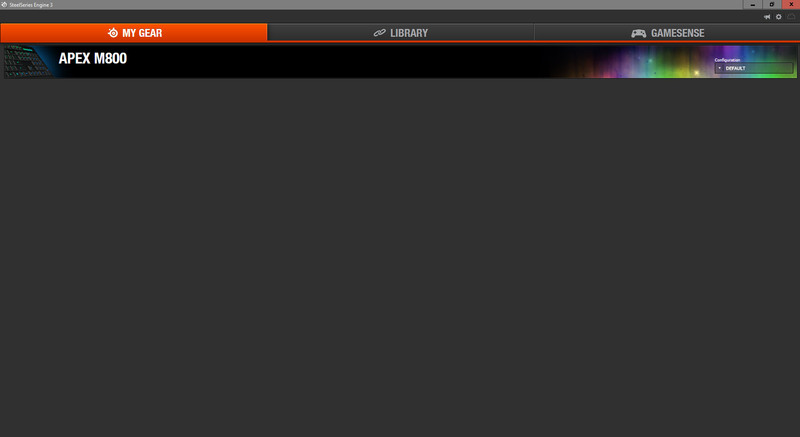 This is where you can do more of the customizing and make use of the preset templates that SteelSeries have included in their Engine 3 software. One of the cool things about the M800 is that it has active and idle modes to which you can set up different profiles. For instance, you could have the active profile a solid colour, then when the idle mode kicks in it could go with a more disco type effect, the possibilities are endless. You can also set the keyboard to play games on it, YES, play games directly on the keyboard. SteelSeries have included snake, minesweeper and lights out which can be played directly on the keyboard.Once ready, setting up your own profiles is easy enough and after a few clicks you will be well on your way. The M800 is without a doubt, designed for gaming so that is what I set out first to do, game! All I can say is WOW! 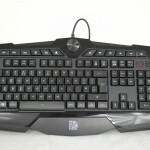 Once you get used to those low-profile keys, the M800 offers spectacular performance and is amazing to use. 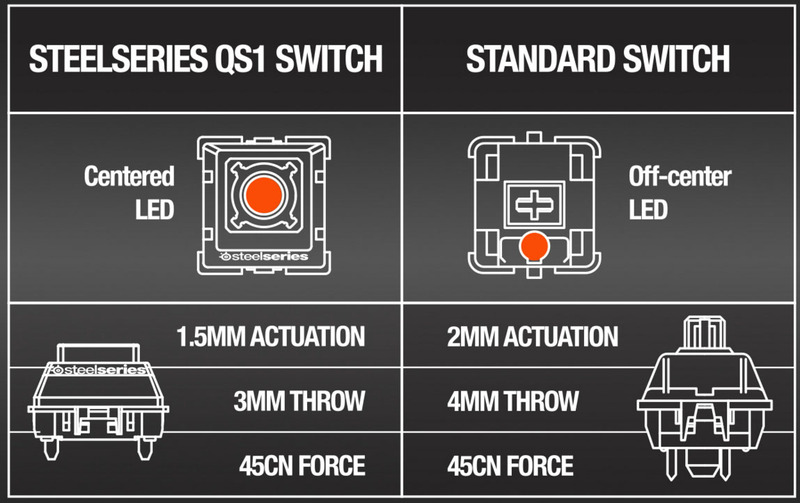 The QS1 switches are easily actuated and truly do offer great performance. When coupled with the low-profile keys, this QS1 will help to give you the jump on your enemies in most any situation. Let us also not forget that the M800 has dual processors, one of which is designated to purely registering key clicks and processing them, making the responsiveness of the M800 even better. I tested the M800 in a number of different games, mostly FPS and I was thoroughly impressed, I could definitely tell my reaction time was a bit quicker than that of my daily use keyboard. One other thing not to forget is the N-key rollover, which on the M800 will let you hit up to 256 keys at the same time with no issues. Wait, 256 keys at once? Are there even that many on the keyboard? I’ll let you figure that out but that is a truly impressive feature to have on any keyboard. For normal day to day use the M800 is also a pleasure. I found typing on it a joy and it was oddly satisfying not to have the loud clicking noise from my cherry red switches every time I wanted to type a review. While Cherry reds aren’t that loud, compare to the QS1 switched there is a big difference. 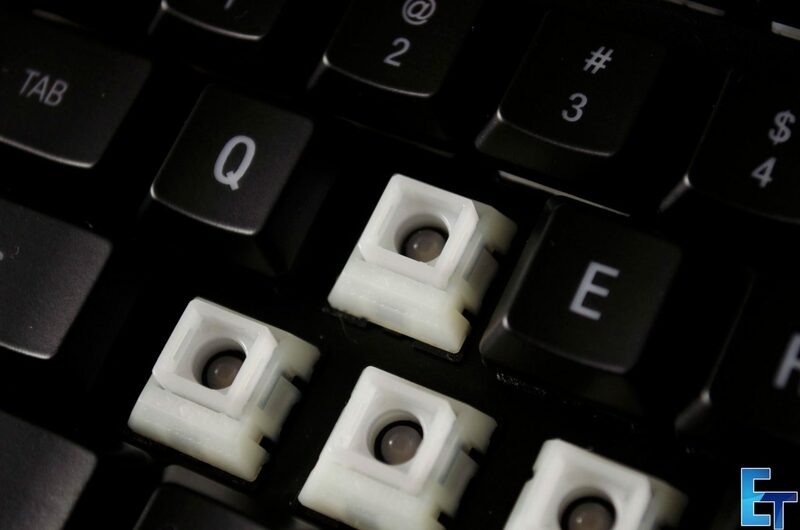 When typing on the QS1 things seemed a lot more fluent and easy, the lower profile keys make it so your fingers don’t have to travel as far to type which results in a faster and more accurate typing experience. All in all, there is no faulting the performance of the APEX M800 no matter what you use it for! The time has come yet again. 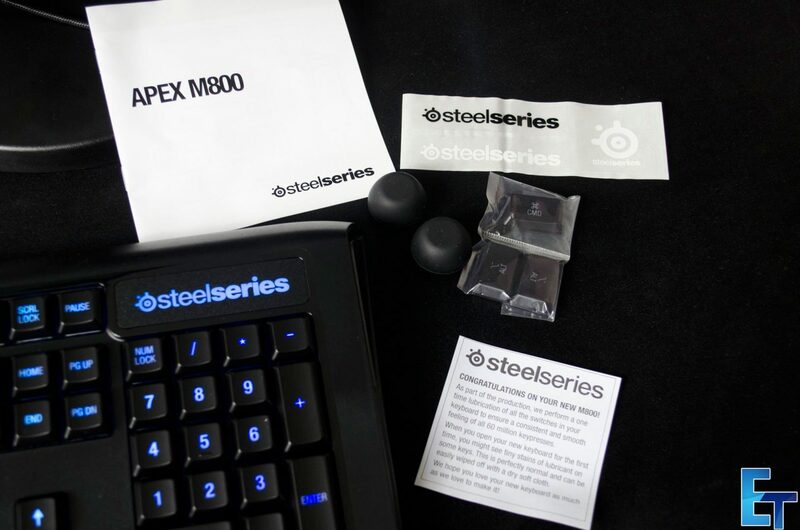 I’ve had a good time testing out the SteelSeries APEX M800 and it is time to wrap up this review. Make sure to check out the video at the beginning of the closer look section to have a proper look at the lighting features, including the FN key lighting which is a very handy feature! Now, let’s get to it. 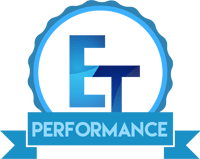 Well, if you actually read the review and didn’t just skip to the end here you will know that the M800 has some serious performance to offer and is a force to be reckoned with. The QS1 switches combined with the low profile keys and dual processors make this a seriously fast keyboard and even coming from a keyboard with Cherry red switches, I can tell the difference. Not only does it look good on paper, but it also really does work and can be felt in-game which is amazing. 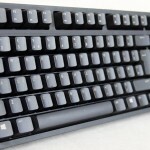 It will be very hard to find another keyboard currently on the market that offers like for like performance with the M800 and that is saying a lot! Not only does it have great performance it also has the features to go along with it to make it one of the best keyboards currently available on the market. 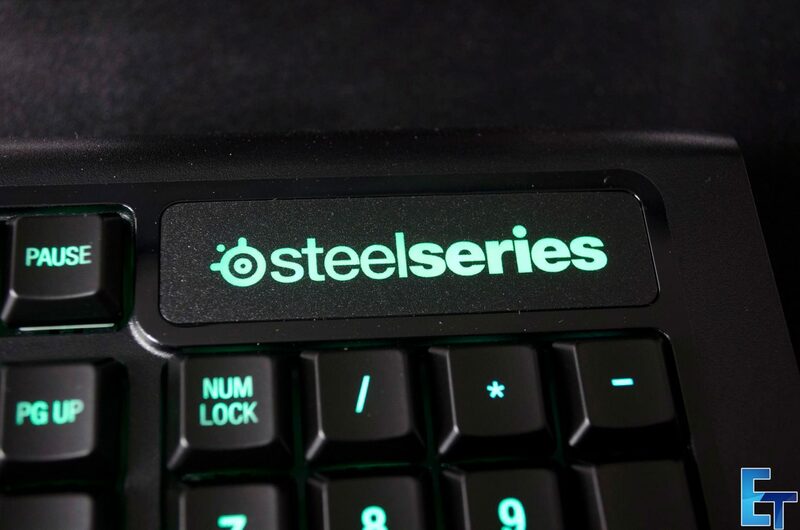 SteelSeries put some serious work in when it came to designing the M800 and it certainly shows. 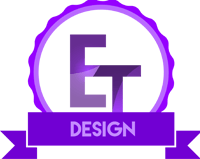 It has a sleek overall look to it and the lighting effects don’t over do it, they offer a functional aspect as well as being aesthetically pleasing. 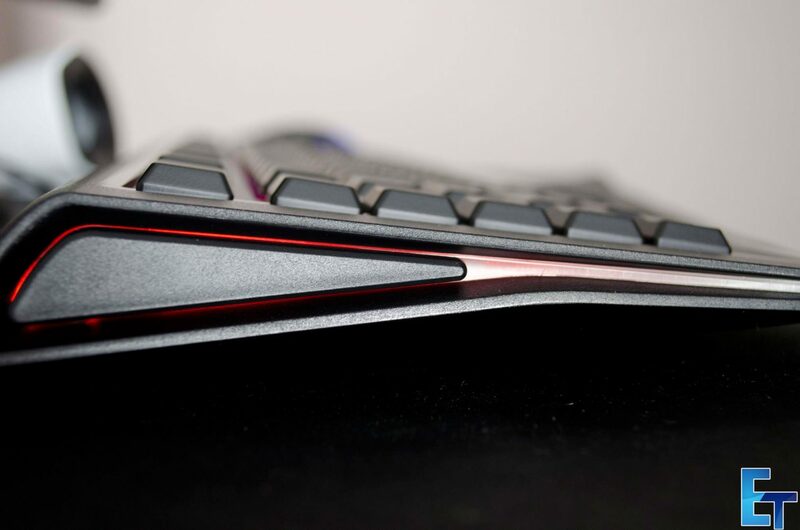 Aside from the looks, the M800 is designed to be the best keyboard on the market. It has newly designed QS1 switches, low-profile keys and a separate processor just to register key clicks which allow it to offer amazing performance. 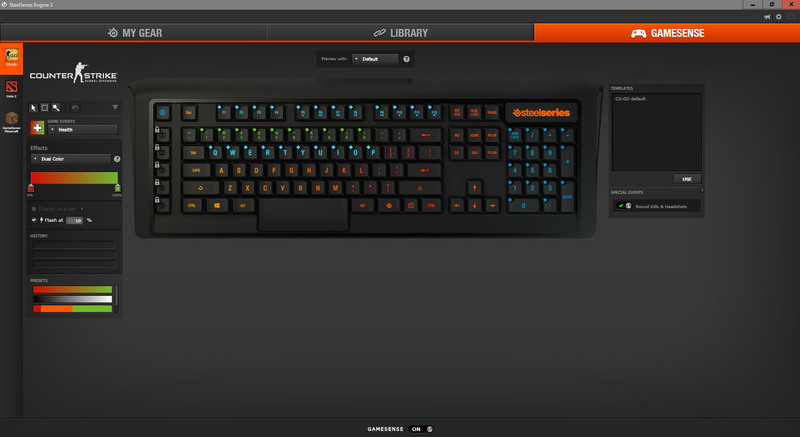 Let us also not forget the unlimited customization options that are available VIA the SteelSeries Engine 3 software. They M800 is a bit bigger than normal keyboards thanks in part to its easy access keys but it’s not overly bulky as to cause any real issues. The APEX M800 is far from cheap, here in the UK it’s coming in at just north of £150 on Amazon UK which is a hefty price tag for a keyboard. However, you have to remember everything you are getting with that money and it starts to become more reasonable. 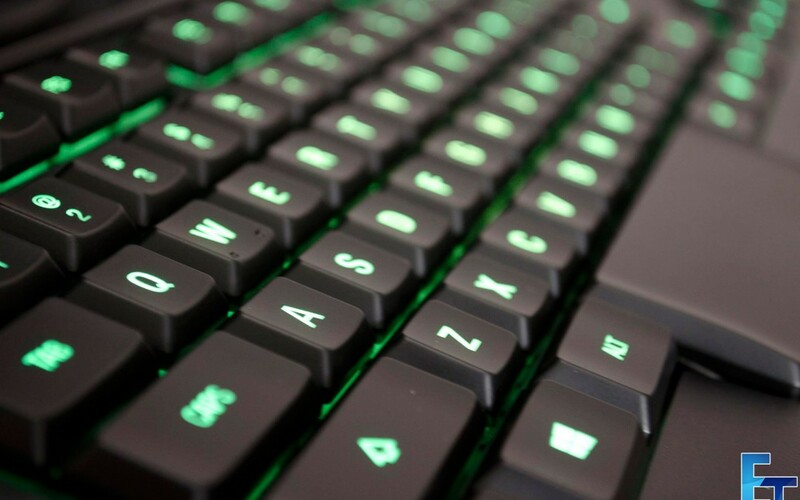 The M800 has a plethora of features from per-key backlighting to newly designed QS1 switches to being able to play snake right on the keyboard itself, the list goes on and on. If you want the best you pay for it and that is what you have here with the M800, one of, if not the best gaming keyboard currently on the market! Yes, I said it and while I haven’t tested all the keyboards out there, I stand by my decision. 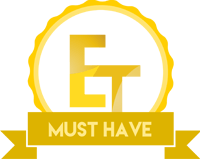 If you want the best keyboard out there, you are going to be willing to pay for it no matter the price. The M800 offers great performance in a sleek package and the newly designed QS1 switches are absolutely amazing and there is just no way to get around that! 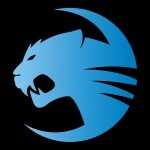 They perform amazing and offer a great experience whether typing or gaming! Major thanks to SteelSeries for sending in the M800 for review!